The 16th Central Committee of the Communist Party of China (CPC) concluded its 6th plenary session in Beijing Wednesday and issued a communiqué highlighting the issue of social harmony. It also set the date and venue for the Party's 17th national congress in the second half of 2007 in Beijing. 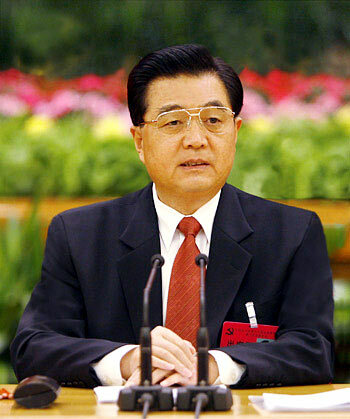 The 4-day plenum, in which General Secretary Hu Jintao made a keynote speech, advocated putting the construction of a socialist harmonious society at a "more prominent position" on its work agenda while adhering to economic development as its central task, the communiqué said. The plenary meeting, attended by 195 CPC Central Committee members and 152 alternate members, is the first of its kind that the Party has ever held focusing on social development matters other than political and economic affairs. "There are quite many contradictions and issues that impair social harmony" even when China is "a harmonious society in general," the document admitted. According to the communiqué, the Party will in the next 15 years commit itself to improving democratic legal system and human rights protection, narrowing wealth gap, increasing employment, improving public service of the government, promoting people's moral standards, securing public order and protecting the environment. To achieve these goals, the plenum stressed that more efforts shall be made to coordinate economic and social development, promote social equity and justice, form a set of common aspirations, ideals and moral codes for the whole society, strengthen social affairs management and services, and create harmonious social relations for the unity of all the Chinese people. While calling for efforts to promote economic growth, the Party also stressed the importance of erecting a new set of common values in the market economy-based society in the making. "(Constructing) a socialist core value system will be essential to cultural harmony in the country," the communiqué said. It called on the whole Party to work for cultural harmony and consolidate the ideological and ethical foundations for social harmony by "erecting the socialist core value system and the socialist concept of honors and disgraces." The plenum also stressed that the role of the CPC itself is crucial for the construction of a harmonious society. Local Party committees around the country should "sharpen political sensitivity, strengthening investigation and research into major social issues" for the effectiveness of their policies, and "properly handle prominent contradictions and issues that affect social harmony in their localities," it said. 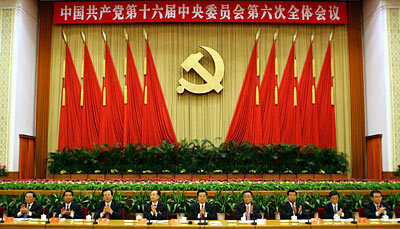 The communiqué urged Party members to strengthen ideological and moral cultivation. It also called for efforts to improve the anti-corruption mechanism and enhance supervision over leading officials and organizations. "Sound ethos within the Party should be cultivated to bring along healthy ethos among the general public and government officials, so as to create harmonious relations between the Party and the masses," it said. Building social harmony "is a major strategic move taken by the Party to build a fair and just society and attain sustainable social and economic development," Wu Zhongmin, a professor with the Party School of the CPC Central Committee, told Xinhua. The Chinese society is divided by a yawning wealth gap, and soaring prices of medical services, housing and education, combined with inadequate social security network and rising unemployment among new grads, are making people more anxious about their future, he said. To solve these problems, the CPC first pledged to shape a "more harmonious society" in its 16th national congress in late 2002, and explicitly made a call to "build a harmonious society" in 2004 in a plenum. General Secretary Hu Jintao defined it as a democratic society under the rule of law, a society based on equity and justice, an honest and caring society and stable, vigorous and orderly society in which humans live in harmony with the nature. Political analysts said this CPC meeting's focus on social harmony would be greatly helpful to resolving the pressing issues in China, and will provide theoretical guidance for national development in the long run. Such views are vindicated by the Party document issued Wednesday. Building a harmonious society is a major strategic task under the guidance of Marxism, Leninism, Mao Zedong Thought, Deng Xiaoping Theory and the Important Thought of "Three Represents," reflects the inherent requirement for the modernization drive and the common aspiration of Chinese people of all ethnic groups, said the communiqué. The plenum also made a decision on the convention of the 17th national congress of the CPC, which will elect a new CPC Central Committee to lead the country for a term of five years. The meeting will be held in the second half of 2007 in Beijing. The national congress, to be held at a crucial period of China's economic and social development, "will be of vital importance for the Party to unite and lead all the Chinese people" in building a comparatively prosperous society and accelerating the nation's modernization drive, the plenum said.